Unlike many other breeds of parrot, the lories and lorikeets are specially adapted to live on a pollen, nectar and fruit diet. A brush like a tip to the tongue, long narrow beak and special digestive enzymes are what makes them unique from other parrot type bird species. Small to medium-sized and often brightly coloured there are several species from Australia, which all have similar requirements. There are over 50 species of lories and lorikeets in areas and countries nearby but only about 7 from Australia itself: 'musk lorikeet', 'little lorikeet', 'rainbow lorikeet', 'varied lorikeet', 'scaly-breasted lorikeet', 'red-collared lorikeet', and 'purple-crowned lorikeet'. I will mention each briefly with pet potential information. 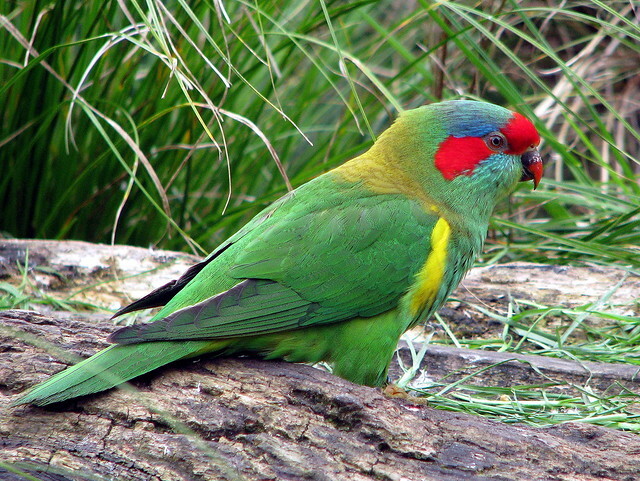 (green keet, red-eared lorikeet) Weighing in at about 60 grams with a length of approximately 22 cm (9 inches). The musk lorikeet relies on mainly native flowering shrubs and trees for food and can cause some problems in commercial orchards. In the wild, the musk lorikeet inhabits coastal woodlands and eucalyptus forests, often in large flocks of several hundred. Very rare as pets in America and Europe but makes a delightful pet in Australia but still not very popular due to government regulations that require a licence to keep native birds. (red-faced lorikeet, green parakeet) Approximately 40-45 grams and about 15 cm (6 inches) long. Like others in the family, the little lorikeet eats mainly fruit, pollen and nectar but prefers to be high in the canopy of trees. In the wild, the little lorikeet inhabits East Australian forests, coastal heath and open woodland, and is very sociable often forming large flocks. Not kept as a pet in its native Australia and a very rare pet in Europe and America. Rainbow Lorikeet. Trichoglossus haematodus Malaccans. (blue mountain lorikeet, green collar lorikeet, bluey, Swainson's loris) 125 grams approximately with a length of about 30 cm (12 inches). Around flowering trees and sometimes in the company of scaly-breasted lorikeets, the rainbow lorikeet may congregate in noisy flocks of several hundred to roost and eat. The rainbow lorikeet is very popular as a pet bird in its native Australia and also quite popular in Europe and America. A pet one can be a good source of amusement as they are always playing, and a young bird can become tame quite quickly. About 55 grams and average 19 cm (7.5 inches) long. In the wild, the varied lorikeet is mainly found in large flocks in Melaleuca and eucalyptus woodlands in the tropical lowlands of Australia. Virtually unknown as a pet in America and Europe and very rarely a pet in Australia with just a few in captivity. 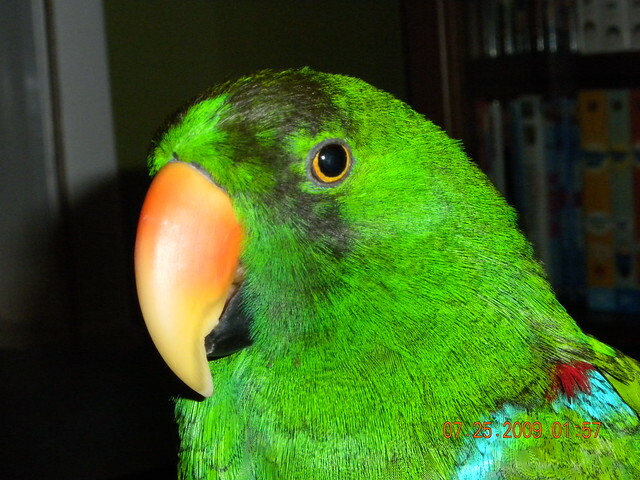 (green and gold lorikeet, greenie) About 75-80 grams and about 23 cm (9.5 inches) in length. Although common in urban areas where it makes use of nectar-rich garden plants, in its natural habitat the scaly-breasted lorikeet will form large flocks, often in the company of rainbow lorikeets. These flocks will travel from tree to tree in the open forested areas of its native land. 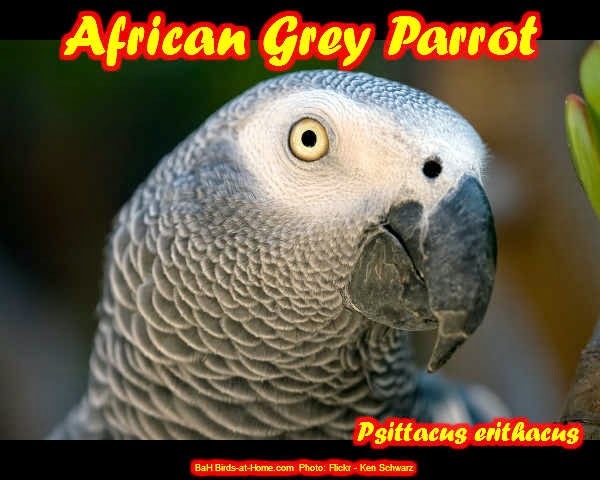 A quiet pet bird which is also playful and affectionate and can be taught to talk really well. 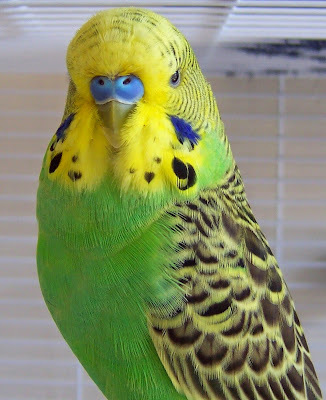 This makes it a popular species of pet bird in Europe, America and its native Australia. Red-collared Lorikeet. Trichoglossus haematodus rubritorquis. Approximately 125 grams in weight with a length of about 30 cm (12 inches). Unlike most of the other species of lorikeet, the red-collared lorikeet prefers to abide as a pair or in a small flock. These move around often due to their food source, the eucalyptus flower being a favourite food so they tend to inhabit the open eucalyptus forests most of the time. 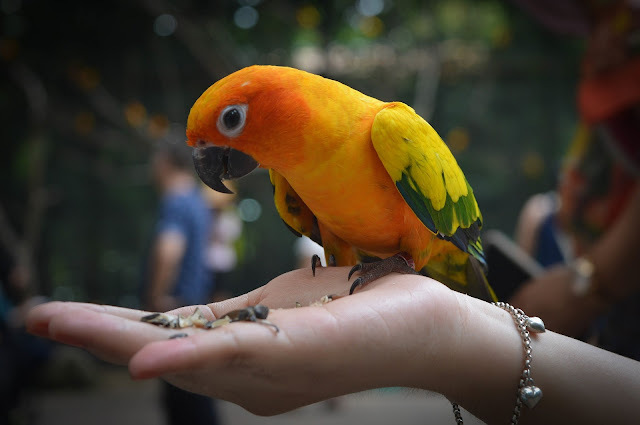 Although good pet birds they are kept in low numbers because of availability and price. (blue-crowned lorikeet, purple-capped parakeet) About 45 grams and around 16 cm (6 inches) long. Will form large flocks where the food source is plentiful, including urban gardens and orchards. Their natural habitat in the West is in forest areas, whereas in the East they tend to go for coastal heath, mallee and open woodland areas. 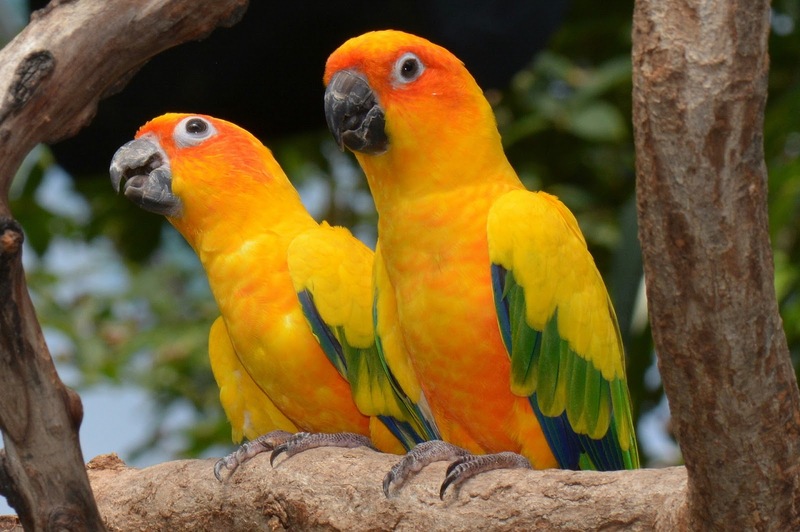 Not very often kept as pets anywhere, but a little more popular as aviary birds. 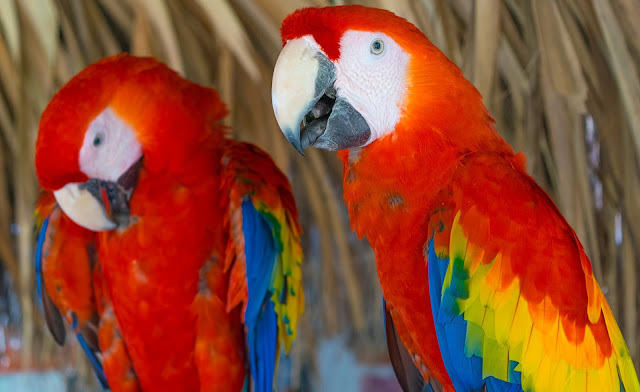 All the above are kept in varying numbers in aviaries around Australia and the Western world, although some are not as popular as pets or companion birds. If kept in an aviary a suspended mesh floor is best for ease of cleaning - just hose it down - due to the nature of the droppings, a solid floor aviary will require continuous cleaning. Due to their special dietary requirements, they can prove to be difficult to give the right foods. Although the bigger species will eat seed, this should not be their main food but is suitable as an extra to their correct diet consisting mainly of pollen, nectar and fruit. And of course, any nectar-bearing flowers will be most welcome. Parrotlets , as the name suggests, are tiny parrots. It is, by the way, generally pronounced parrot-lets although some people insist that the "t" in the parrot part is silent and call them parro-lets. 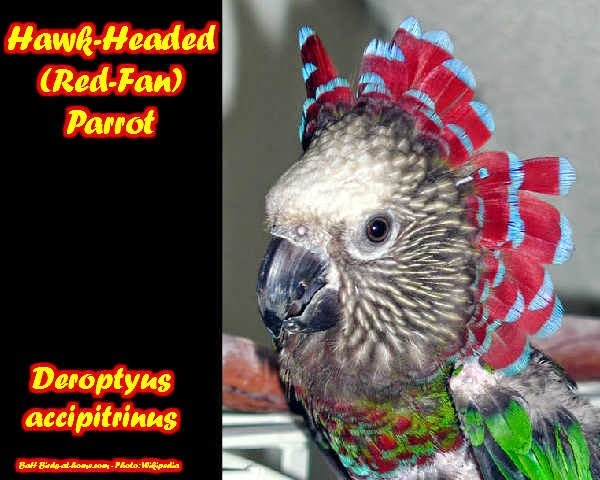 Although only 4 to 4 1/2 inches tall, they are true parrots with big parrot personalities and intellect. They are known for being a little feisty, but if handled regularly they are loving pets. They are very playful and like their bigger cousins can be taught to do tricks and to talk. There are several species of parrotlet, but probably the most common for pets are the Pacific parrotlets. The males are predominately green with blue markings on their wings, rumps and heads. Females lack the blue markings. Although green is their natural color there are a number of color mutations available. They include yellow, blue and white. Parrotlets, with good care, can live 20-30 years in captivity. If their wings are left unclipped they are very nimble flyers. They can hover and dart and perform some impressive aerial acrobatics that you don't see with larger parrots. Unless you have a large, safe, secure environment for them to fly in, however, it is usually safer for them and easier for you if you keep them clipped. To be happy and healthy you will have to provide them with a cockatiel sized cage with a few toys, fresh water and food. A mixture of small seeds, a few sunflower seeds and small pellets make a good diet. Supplement that with some fruits and vegetables. If you have one parrotlet, it will become bonded to you and should be quite friendly. If you have two or more they tend to be closer to each other, naturally, and usually are a little less tame. Make sure you get a parrotlet that was hand fed as a baby. Hand fed babies are much more socialized to people and make much better pets. Like any pet bird, they require regular attention, but they are good at amusing themselves for long periods of time while you are away. Parrotlets are relatively quiet parrots. They chirp and chatter a lot but they don't scream like larger species. That, along with their small size makes them a good choice for apartments or other small living spaces. They are fun to own, fairly easy to maintain and can be great little companions.